This last week, after Easter, I slowly made some changes around the house to bring it more to a place of "Spring", and not so much "Easter". I had a bunch of bunnies hanging around, so this week they've been packed away...except for one or two that do "double duty". One of my favorite little guys is this felted wool fella that I use on my Springtime wreaths. I have a grapevine wreath as the base here, and then I add a large floral candle ring or small wreath layered on top. 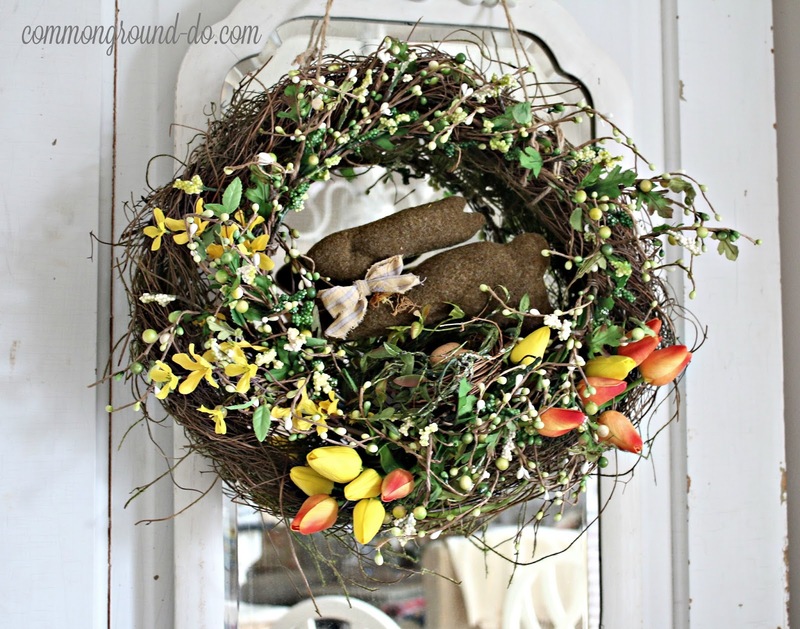 I usually attach the second layer to the grapevine wreath with gardener's twine or floral wire. Then I tuck in seasonal florals. I don't use glue since it's not on a moving door and this never gets jostled, that way it's super easy to change it up without having to have a completely new wreath. Then you could add a nest, a bird, or just let the felted bunny come back and do his thing. 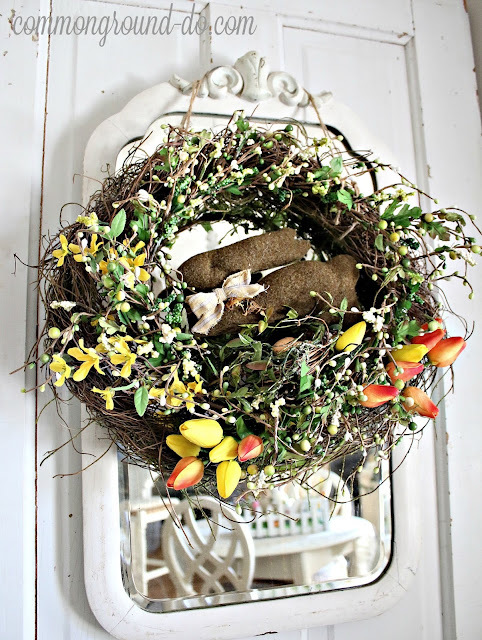 You can click over to this post for a more detailed DIY of my Easy as 1-2-3 Custom Wreath. Here he is on my Seed Packet Garden Wreath I had up earlier this Season. 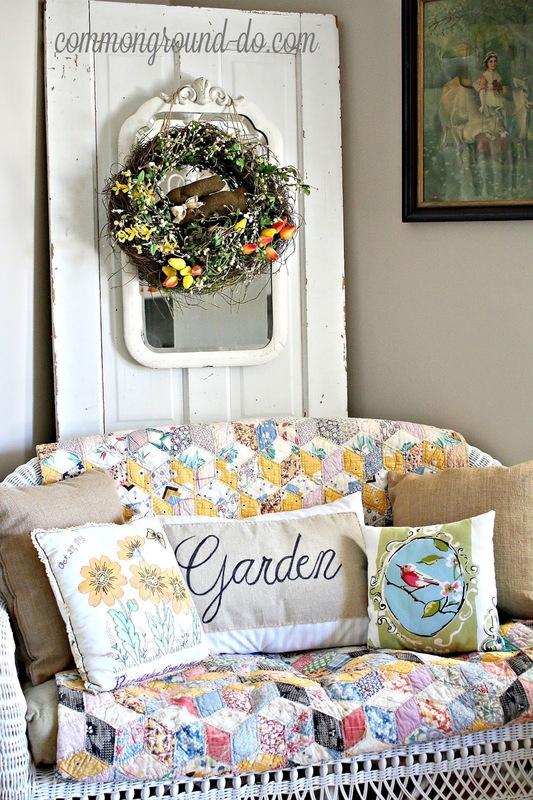 I was using browns and greens here in the Kitchen Sitting Room, and the Garden Wreath just seems to go with that theme a little more to me. But he's not attached so he can make his "jump" on over to any other Spring wreaths that might be coming up. I've been told that I change up my white wicker settee here, about as frequently as I change my clothes... well, not quite, but I do love to keep the seasons rolling along in here. It's good therapy for when you're bored because you don't have a lot of places to "decorate" any longer. 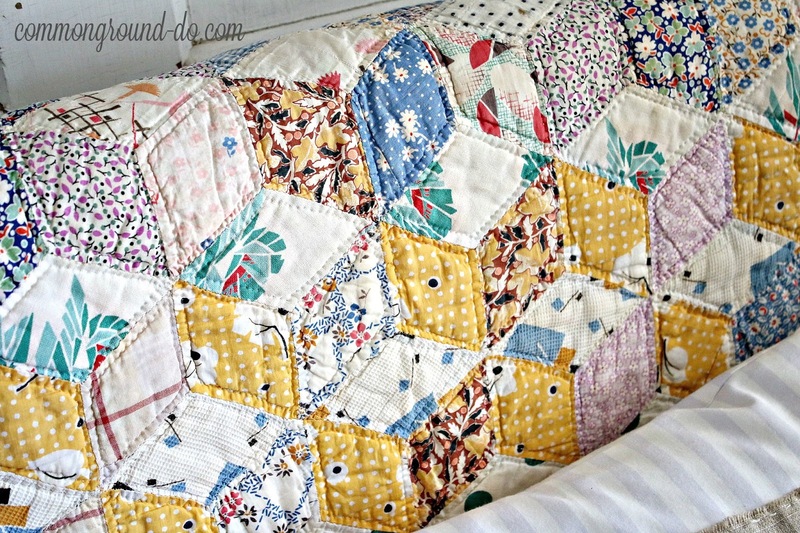 This is a fresh as Springtime Vintage Tumbling Blocks quilt that I love to use with pastels in April. It's about the only time you'll see me decorate with those colors. I have a few pastel pieces I want to bring in on the Baker's Rack, so I'll have to hunt through my smalls to find them. The fabric on this is getting pretty fragile. I was spot cleaning a little spot and the yellow fabric just deteriorated before my eyes. eeeeck. Cats on a towel here only, please. Vintage embroidered and painted pillow from 1935. And this one I bought a few years ago from the talented Judy from 20 North Ora. The other 2 burlap pillows are the ones I used last month but just turned around, and the "Garden" script pillow is from several years ago at a Spring Open House at Leola's in Ozark Mo. It's only about 47 degrees outside today, rainy and blah, tomorrow will be sunny and mid-sixties. I'm wanting to get my patio put together for the Season. I found some great all weather white wicker chairs at Pier 1, which I'll share soon. I'm looking forward to puttering on the Potting Bench with some new container plants and puttin' my feet up with a Crystal Light Mojito. Hope you're having a great weekend! The wreath is darling. I love that bunny. The quilt is gorgeous on your settee. It's cold here today too. I hope you are having a great weekend. Soo cute ! Love the wreaths ! 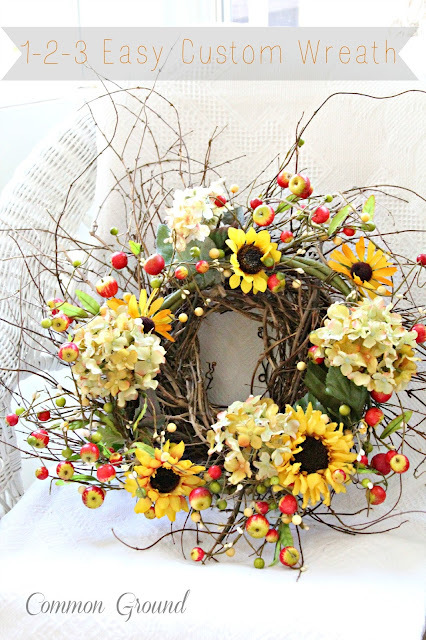 Your wreaths are gorgeous, Debra! Very simple and natural and that's the way I like them. 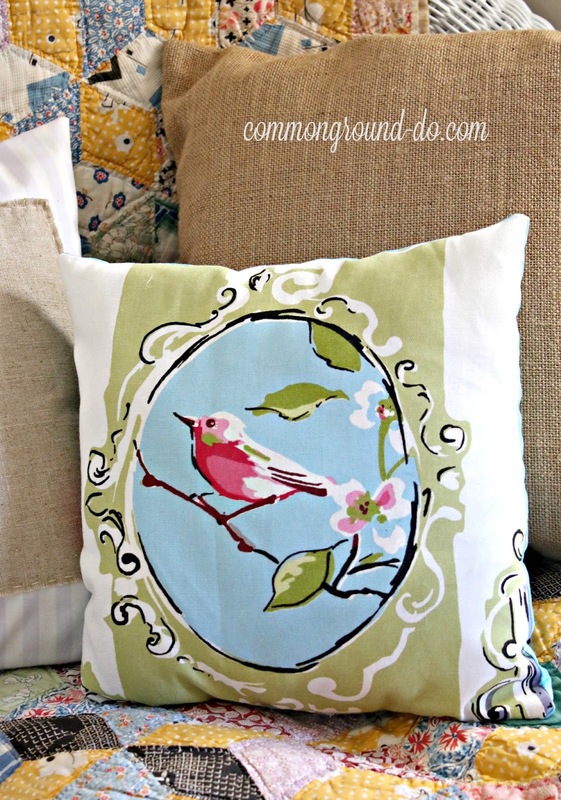 I'm looking for new outdoor seating cushions...and then I know I'm going to want some toss pillows!! Love yours. Hi Debra. 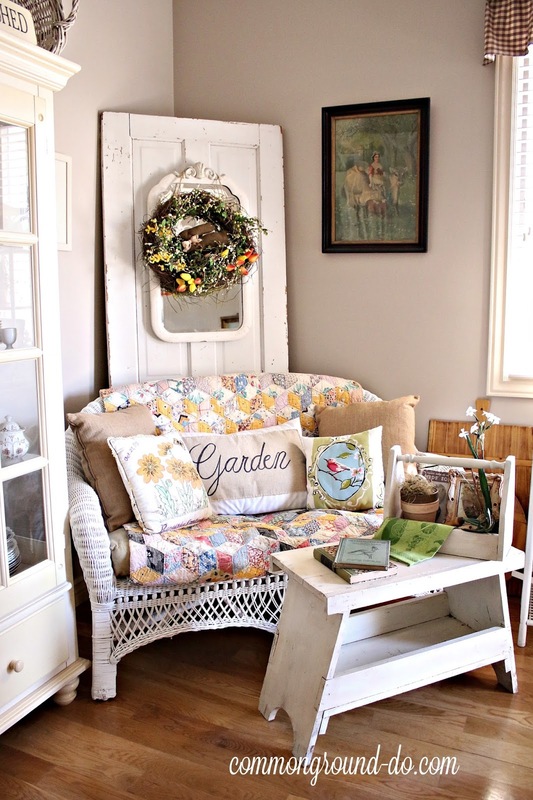 I always love seeing the many changes you make on your wicker bench. 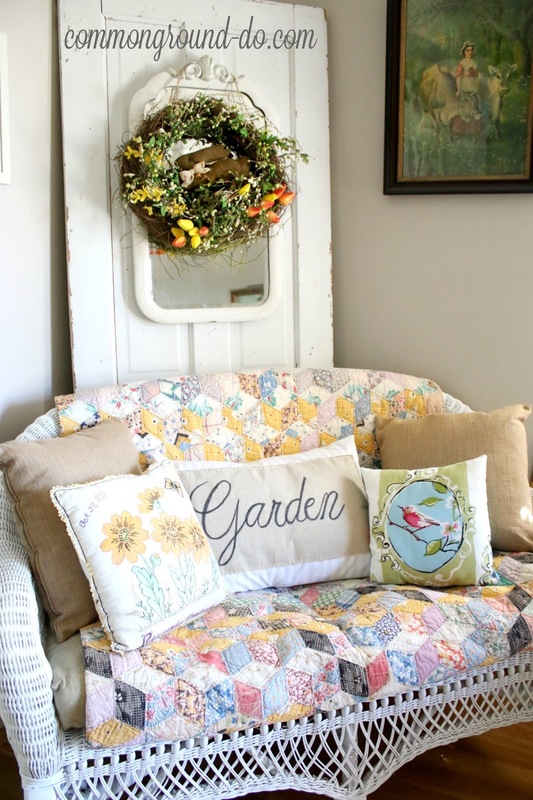 The pillows and the quilt are so lovely and your wreath designs are soooo pretty! I'm waiting for the power washers to show up before I decorate my screened porch and here in the South it could take forever! LOL! Debra, thank you for your very sweet comment on my blog. I know that you have had many health problems and difficulties and I will always remember you in my prayers. 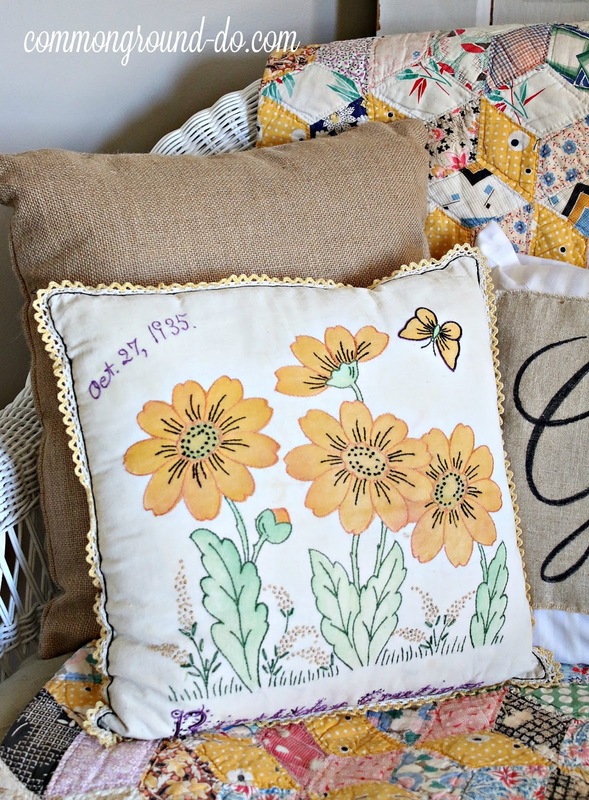 Your vintage quilt and painted pillow create the perfect spring corner, Debra! We woke up to a dusting of snow this morning, so I'm trying to bring a little spring indoors to brighten up the gloomy day. We had one nice day this week and I got to spend it with one of our grands. We spent the afternoon at a park and it felt so good to soak up some spring sunshine! I hope you get to sit on your new wicker chair and enjoy a mojito! the way you used your quilt is inspiring. mine are hidden away and I'm going to get them out and use them. Such a waste to not show them. 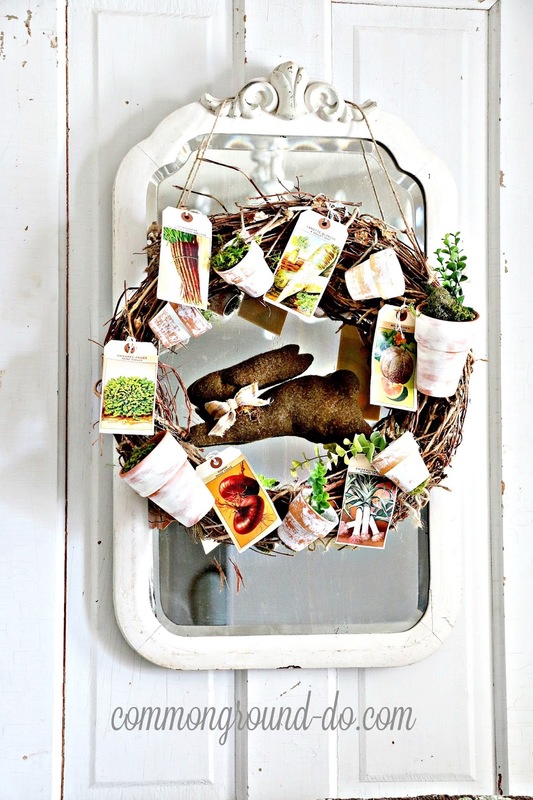 Your garden wreath makes me think of Benjamin and Mr. McGregor. Love your spring wreaths..you always create the most beautiful wreaths for every season....and must say, I love seeing your wicker settee so graciously staged for each season too...love that quilt and its happy Spring colors!